Summer of Sonic 2016 Hinted? With both America and Japan having 25th anniversary themed parties, many people in the UK were asking ‘what about us?’ Well… Something might be happening. The official Summer of Sonic Twitter & Facebook pages updated with the image you see above. 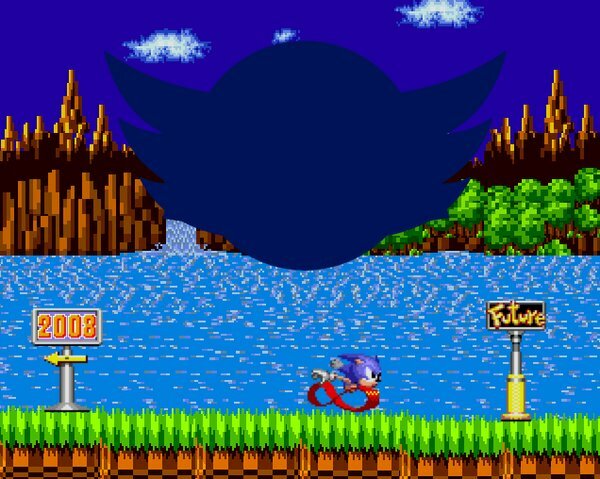 For info, the year 2008 was the year of the very first Summer of Sonic celebration, and he’s running towards the ‘future’. Utterly no new information was given, but the last time the twitter account updated was back in 2015, which ironically was to announce that there wouldn’t be a summer of Sonic for that year. This certainly seems like a strong hint that something might be coming. Now because a certain day of trickery is upon us, and some of you are still in a time zone which is still April 1st. The update was posted AFTER April Fools Day in the UK. We’ll keep you updated with more details as and when we get them. Next Post > Next post: Summer of Sonic 2016 Announced, Dated & Kickstarter Launched! Isn’t Summer of Sonic pretty much fan organized and such? You Aussies just need to group together and combine the power of passion for Sonic and… eh whatever. Are you serious three Sonic events in CA JP & now UK wow that’s insane to be super excited then super hype also we all remember last year Nintendo added a Sonic Amiibo contents of games like!! Super Smash Bros For 3DS & Wii U first as usual Mario Kart 8 second Super Mario Maker third Yoshi Wooly World fourth okay last but not least is Mario & Sonic At the Rio 2016 Olympic Games, last to be awesome as our favourite Sonic mascot character of all back in the 1900S! Poor modern Sonic still has no attention.